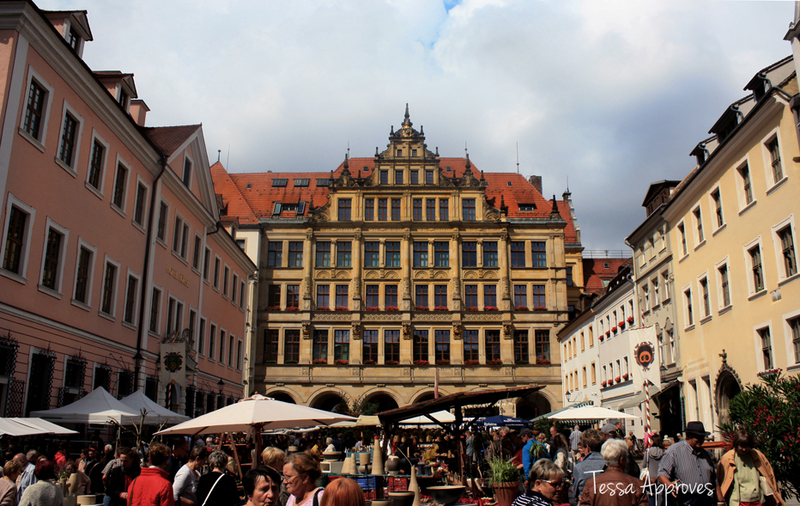 The Untermarkt in Görlitz (lower market) is the older of the two main market squares in Görlitz and, in my opinion, the most beautiful spot in the city! 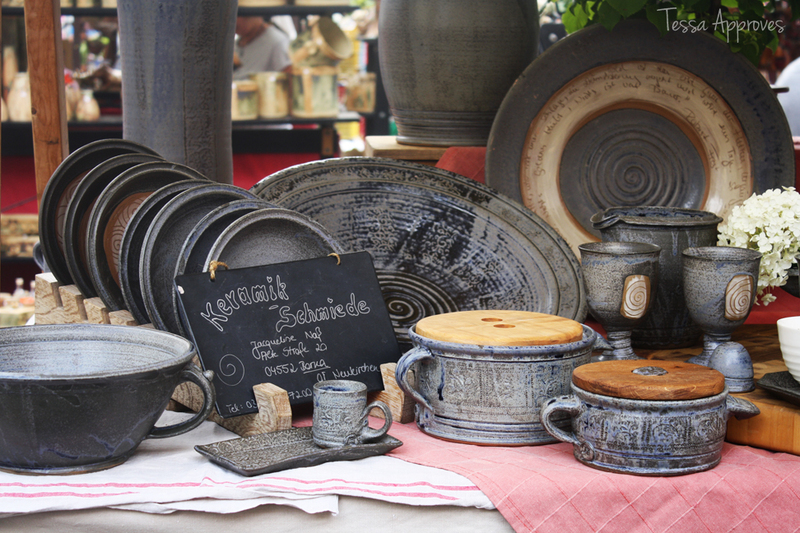 The Untermarkt is lined with beautiful Renaissance buildings and is divided in two by a row of buildings in the center of the square called die Zeile (the row). During warm seasons you can find people sitting out at the cafes and restaurants in the evenings, enjoying the magical atmosphere of the historic market with its cobble-stoned streets and arcades. 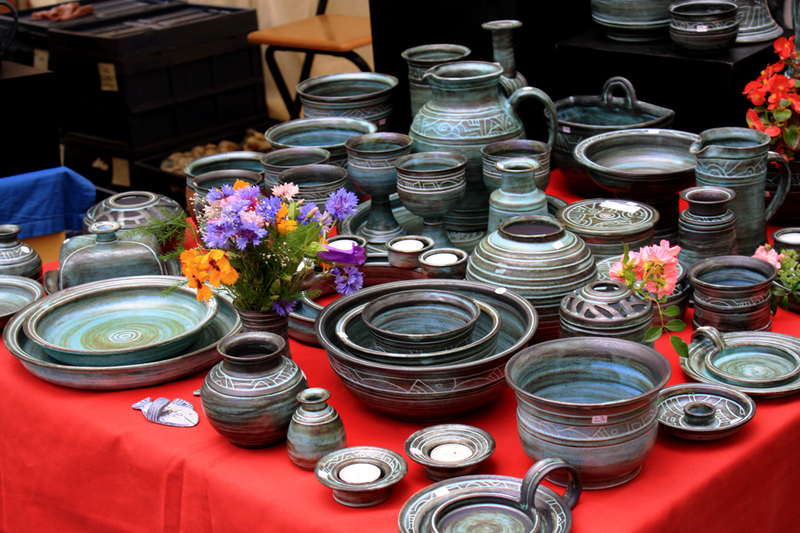 Many of Görlitz’s festivals take place on the Untermarkt like the Tippelmarkt and Altstadtfest. 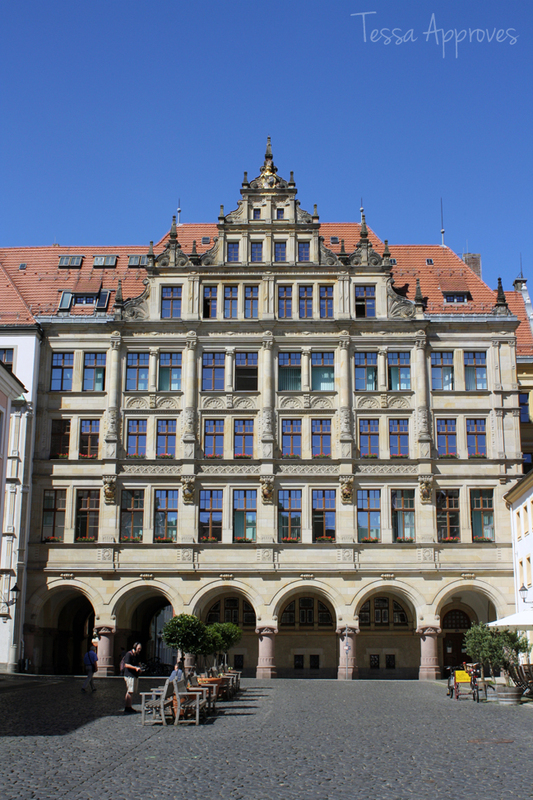 The Rathaus (town hall) actually consists of several buildings from different time periods. 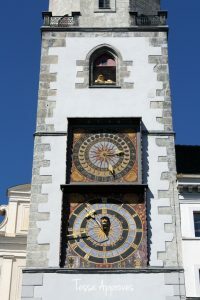 The old town hall (Altes Rathaus) dates back to the Renaissance period – inside there are beautiful painted wood ceilings and you can peak into the inner courtyard with its bay window for the court.The Rathausturm (town hall tower) was built in the 16th century with elaborate clocks, dials and a lion that roars with organ pipes. If you take the tour of the tower you may be able to push the button that sets the lion roaring, like I did! 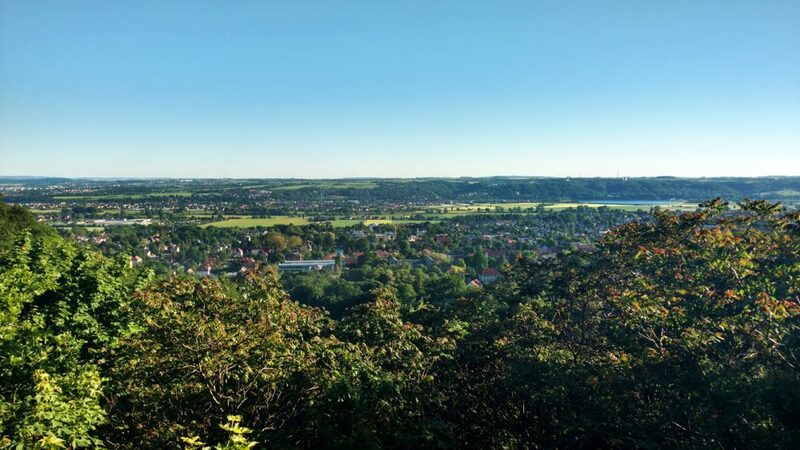 But that’s not the only reason to climb to the top – the panoramic views of Görlitz from above are well worth the climb! 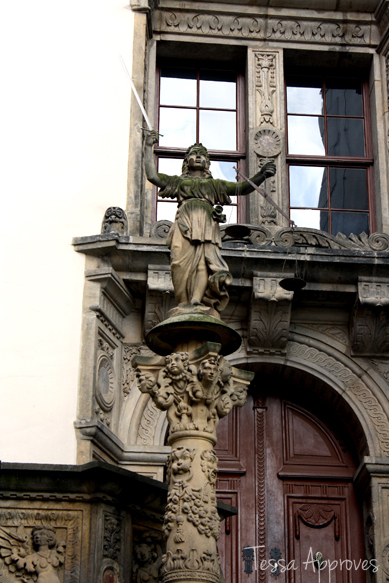 The town hall steps are decorated with a statue of Justitia – but she is not blind, a symbol of the free jurisdiction that the city of Görlitz had. 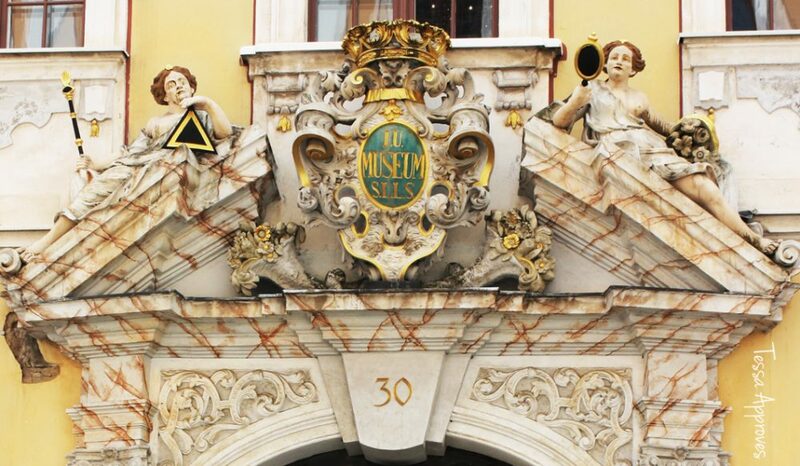 The new town hall (Neues Rathaus) was built at the beginning of the 1900s in neo-Renaissance style and features the coat of arms of the Lusatian League – an alliance of six towns: Görlitz, Bautzen, Kamenz, Lauban, Löbau and Zittau. 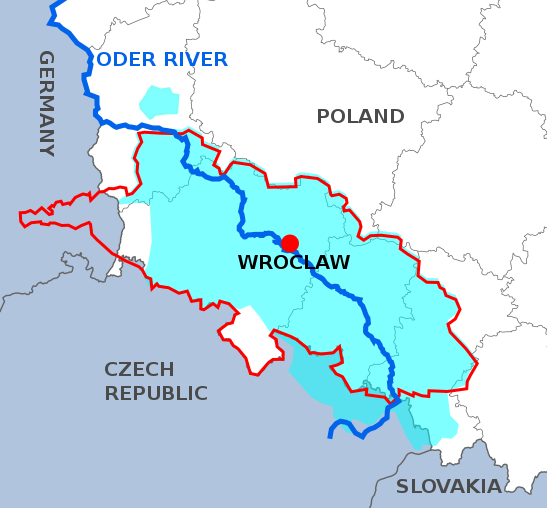 Lauban now lies in Poland and is called Lubań. 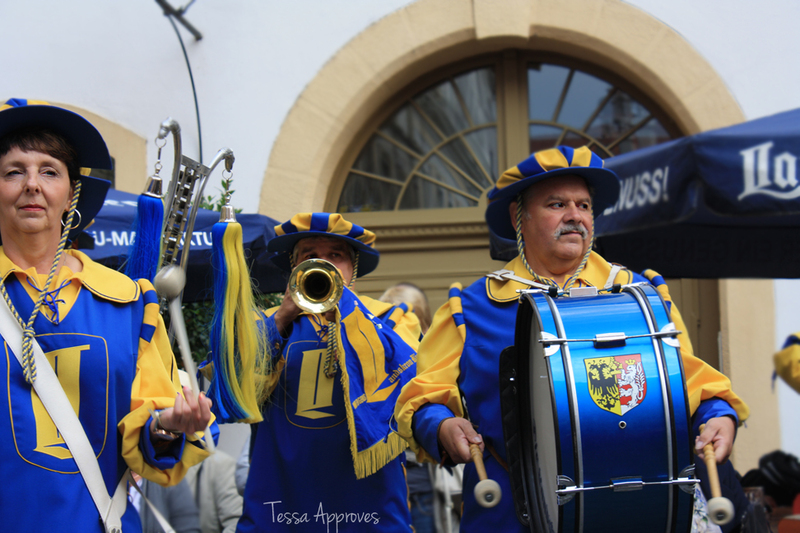 This league increased the security and political influence of its member cities from 1346-1635. From March through December there are tours of the tower Wednesday-Sunday from 11:00am-6:00pm on the hour. Tours are in German, require no reservation and cost 4€ for adults. 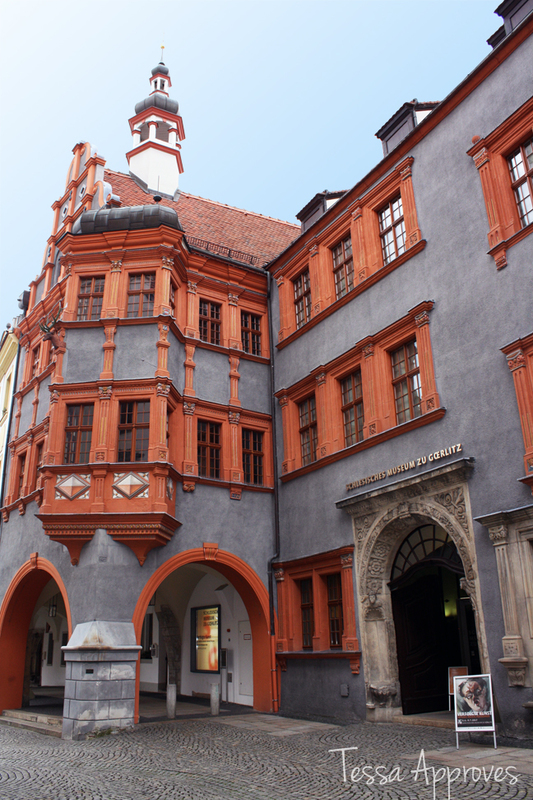 Schönhof is the oldest Renaissance building in Görlitz – after the city fire in 1525 it was rebuilt by the council’s master builder, Wendel Roskopf the Elder. 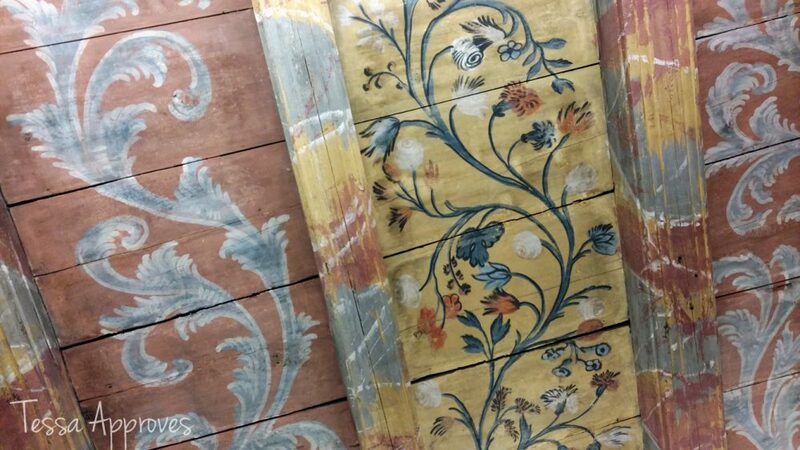 The wooden ceilings and wall paintings inside have been preserved form the 16th, 17th and 18th centuries – that alone would make the building worth a visit, but it is also home to a fantastic collection of items housed by the Silesian Museum. 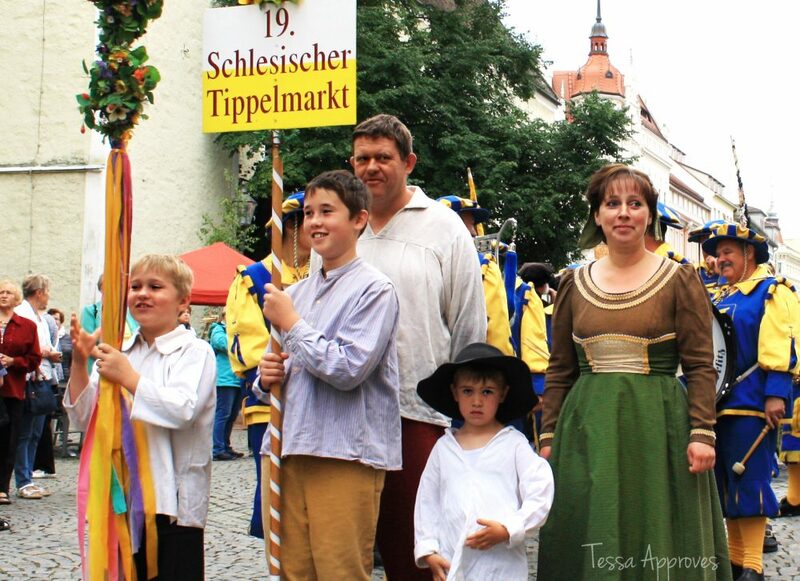 The Scales (Waage) is a Renaissance house in the middle of the Untermarkt, constructed in 1600. 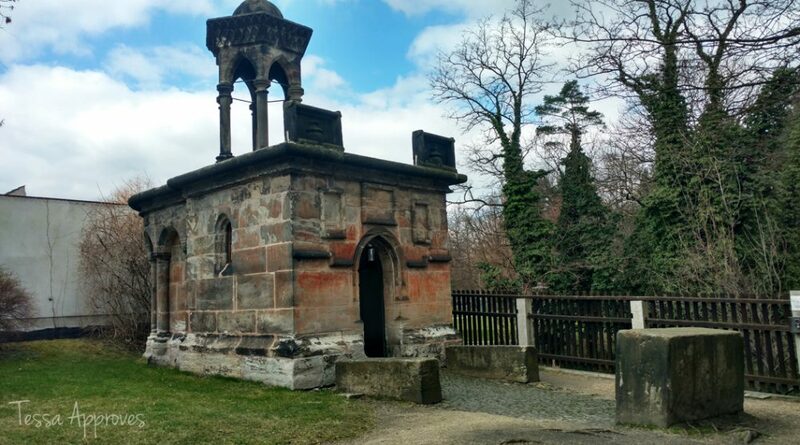 When goods arrived in the city they were weighed, registered and paid for here. 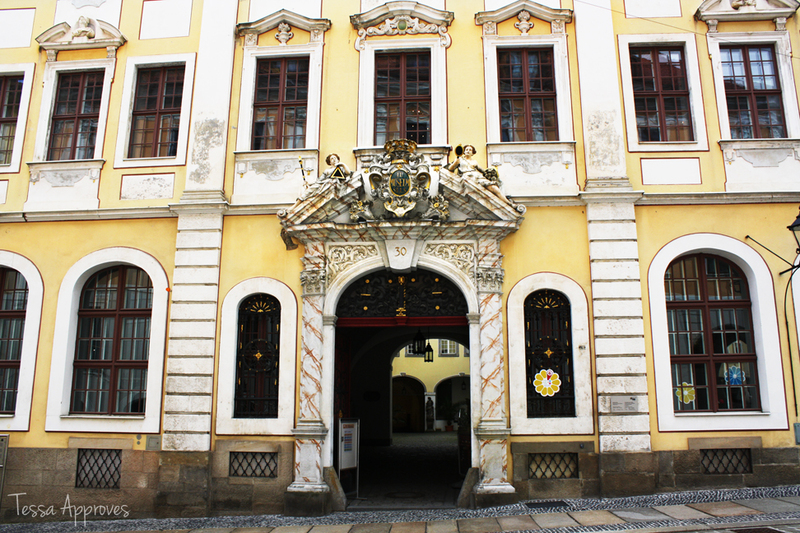 The Brauner Hirsch (brown deer) is a baroque town house and one of the most extensive houses in the city. It used to be a hotel and brewery. The building (as well as the Untermarkt in general) is very popular with film makers, like Wes Anderson in his film Grand Budapest Hotel. Click here see side-by-side photo comparisons of scenes from the film and locations in Görlitz. 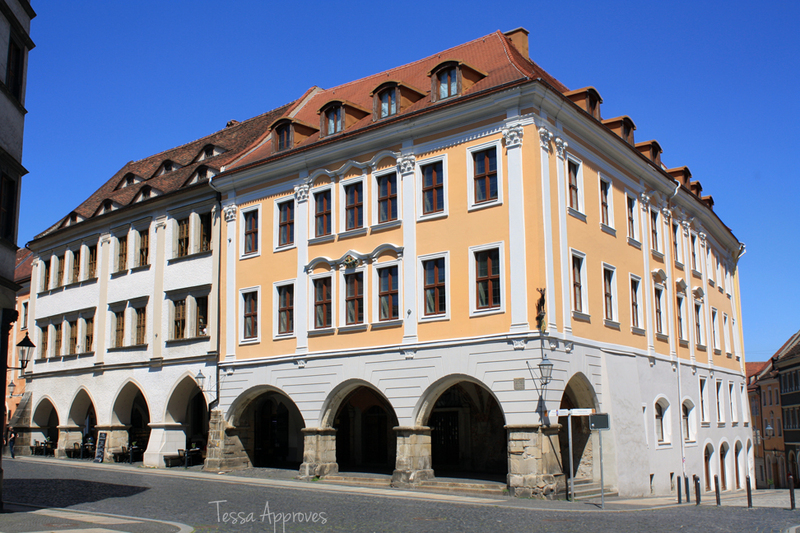 The Ratsapotheke (the town apothecary) is a Renaissance building with a beautiful façade and portal rebuilt by Wendel Roskopf the Younger around 1550 for a merchant. 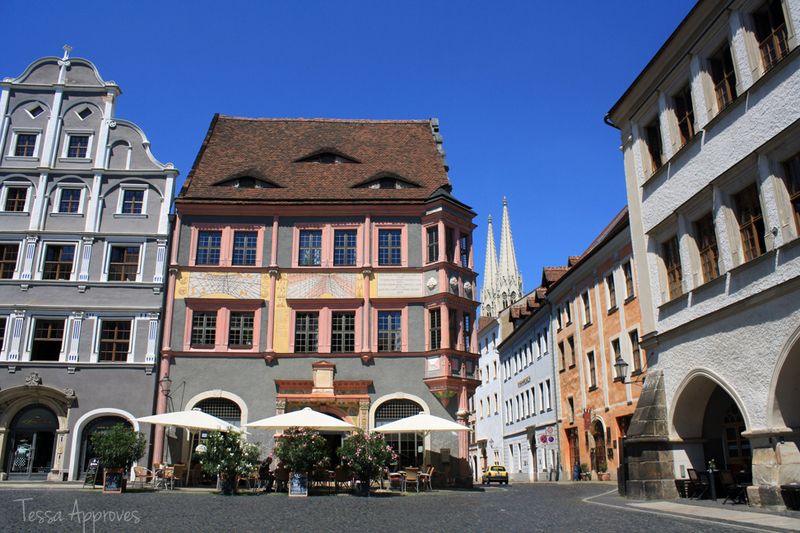 Until 1832 it was the only pharmacy in Görlitz and today you can sit outside and enjoy a coffee and dessert in its café. 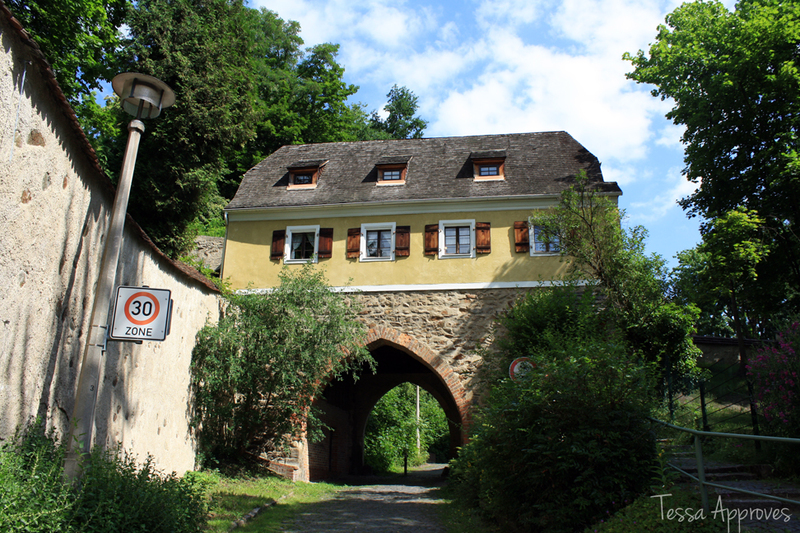 The “Whispering Arch”(Flüsterbogen) gets its name from a unique auditory effect – if you put your ear to one end of the arch while someone whispers into the other, you can hear them clearly at the your end. So climb up and put your ear to the arch – don’t be embarrassed, every visitor has to try it at least once! The Nikolaivorstadt is the oldest neighborhood in Görlitz located northwest of the old town. Even though it’s just minutes from the main sights it feels much more peaceful & relaxed. 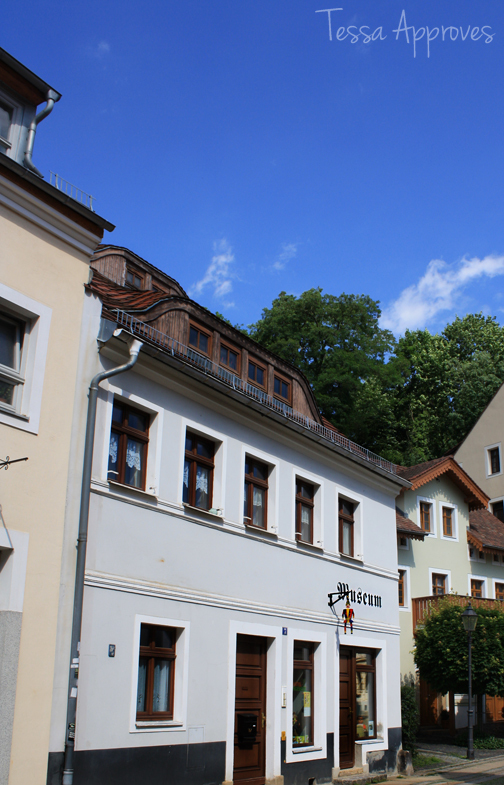 It’s my favorite area of Görlitz and the place where we have bought and are renovating our house! 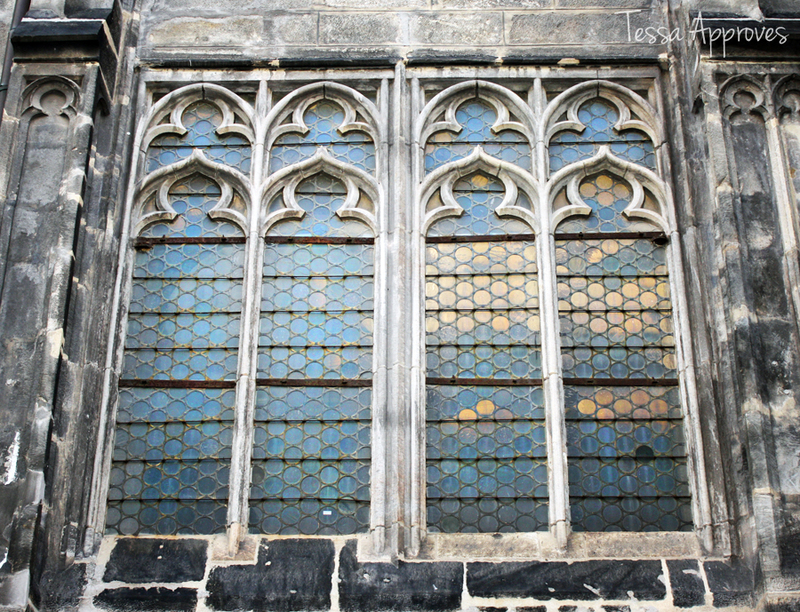 There are many beautiful & interesting sights in this neighborhood, which make it worthwhile to stray from the center during your visit to Görlitz to check some of them out. 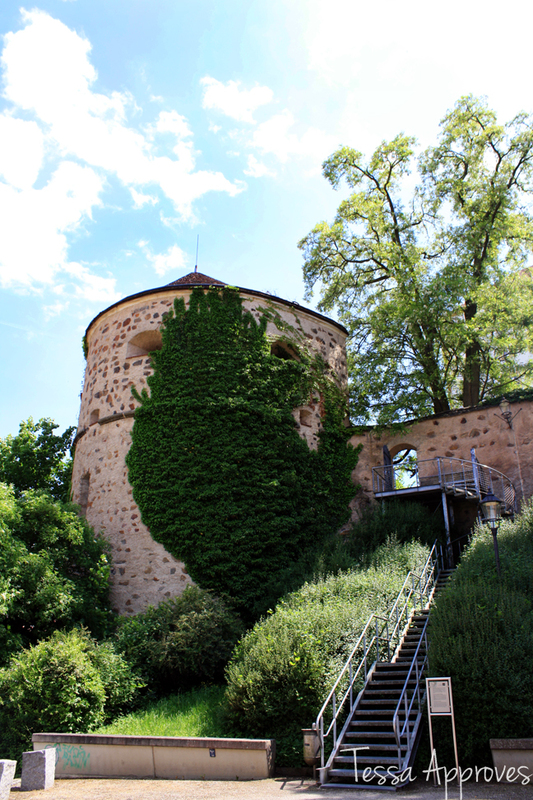 This tower was part of the city fortifications and protected the northern gate. 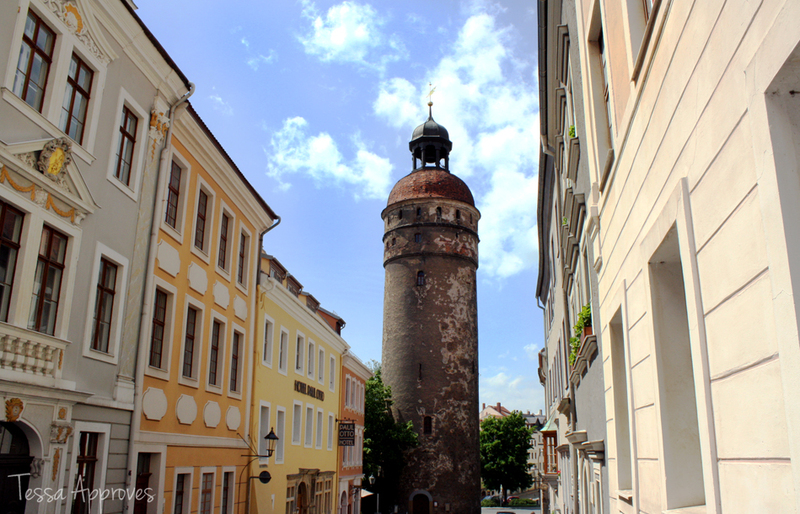 Nikolaiturm is 45m high (about 148 ft) and has a copper top. The first mention of the tower was in 1348 and until 1903 a tower guard lived inside the tower on the top floor, ringing the bell whenever there was trouble, such as a city fire. The tower is open to visitors from April to December on the 2nd and 4th Saturdays of the month. 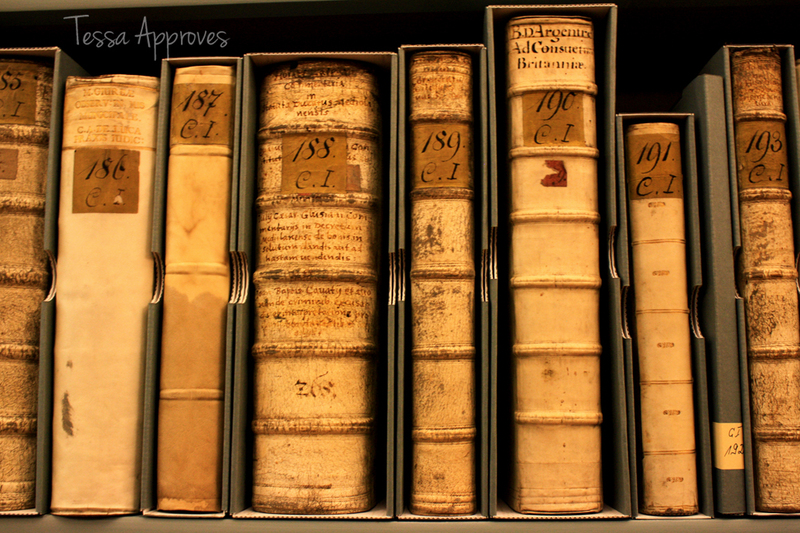 Tours are at 2pm, 3pm and 4pm and last 45 minutes. The price is of entry is €4. Inside the tower there is an interesting museum and they have kept the apartment furnished to look like it did when someone lived there. 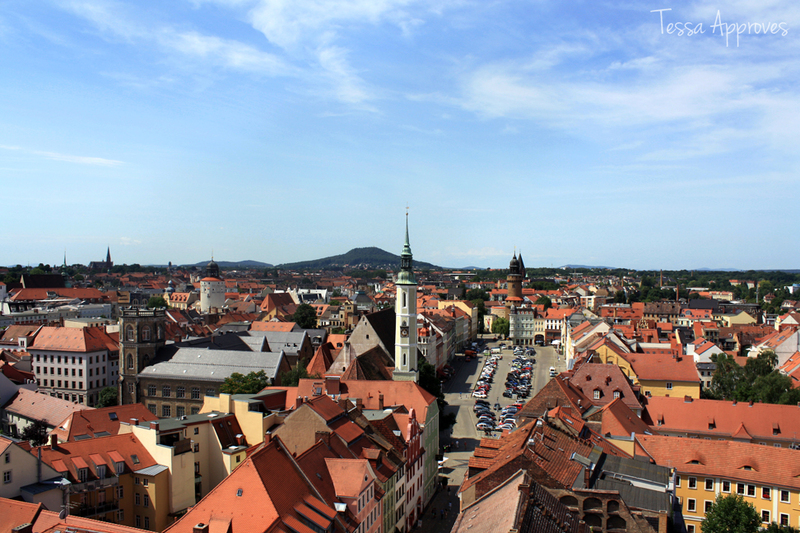 Once on top you will have a beautiful view of Görlitz. 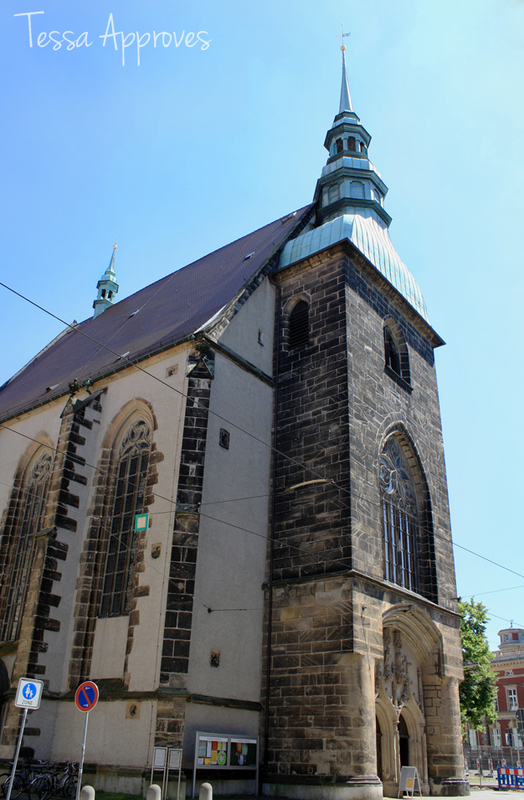 There are also four other towers in Görlitz that you can visit. This garden path leads from the east side of the Peterskirche to the Nikolaiturm. The Nikolaizwinger was the area between the double city walls. The northern gate to the city stood between the Nikolaiturm and the present day Nikolaizwinger. In 1954 the space was converted into a green park, making it a peaceful place to sit or go for a walk. It’s usually many degrees cooler than the old town due to the shade. The Hotherturm is also along the Nikolaizwinger. It was built in the 13th century and is the only remaining corner bastion of the 30 that once lined the city’s fortifications. 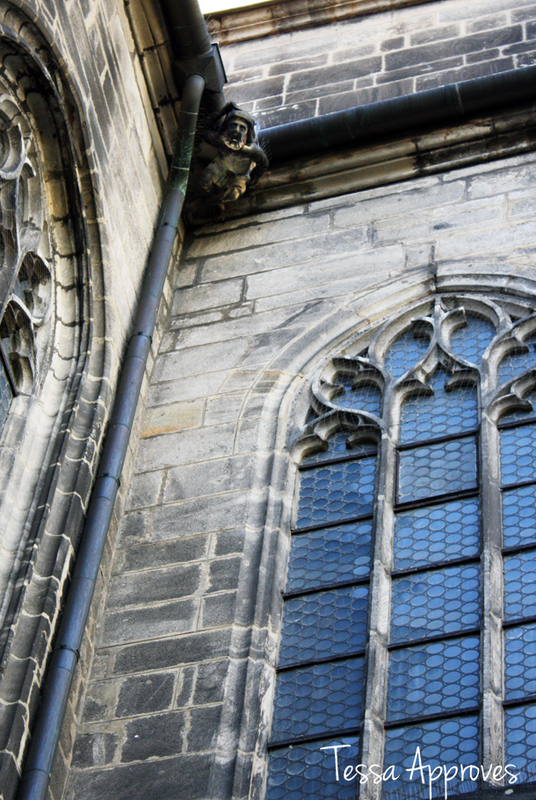 The tower can be visited during the Scharfrichterführung (executioner’s tour) from March-October biweekly on Fridays at 5pm. The cost is €5. 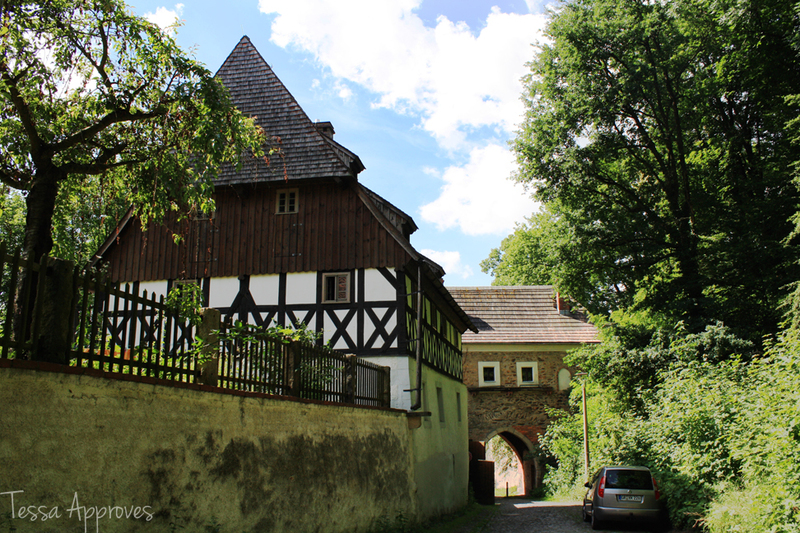 The Finstertor (dark gate), also known as Armesündertor (poor sinners’ gate) was part of the fortification of mud walls and fences protecting the Nikolaivorstadt and the last part of this wall remaining in Görlitz. 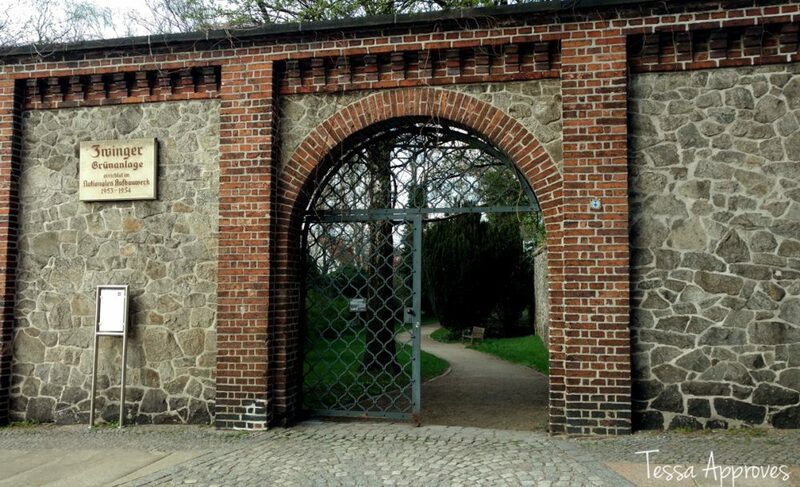 It was first mentioned in 1455 and its name was due to the fact that condemned criminals would pass through the gate on their way to execution. 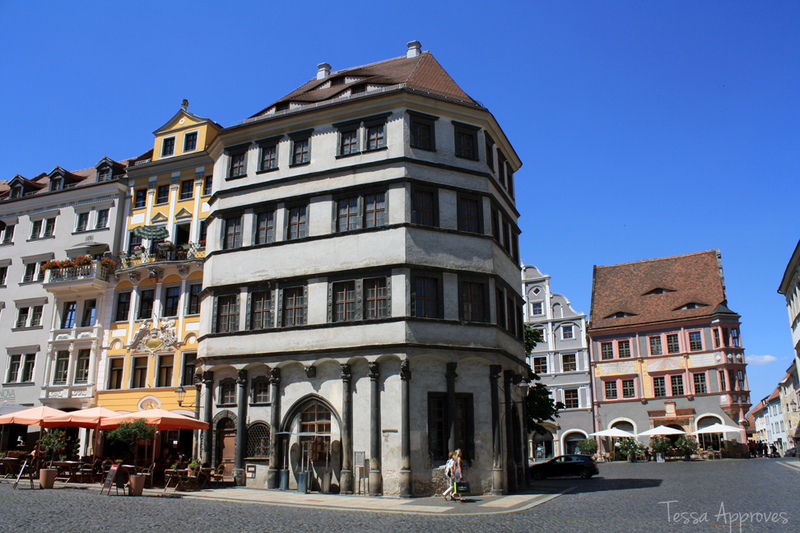 The Scharfrichterhaus, or executioner’s house, sits next to the Finstertor and is the only fully preserved half-timbered house in Görlitz. The outside of the house bears a sandstone tablet with the inscription “In the year of Christ 1676 LxSxB”. The initials refer to the executioner Lorenz Straßburger, who lived in the house at that time. The Scharfrichterhaus can also be viewed in conjunction with the Scharfrichterführung. 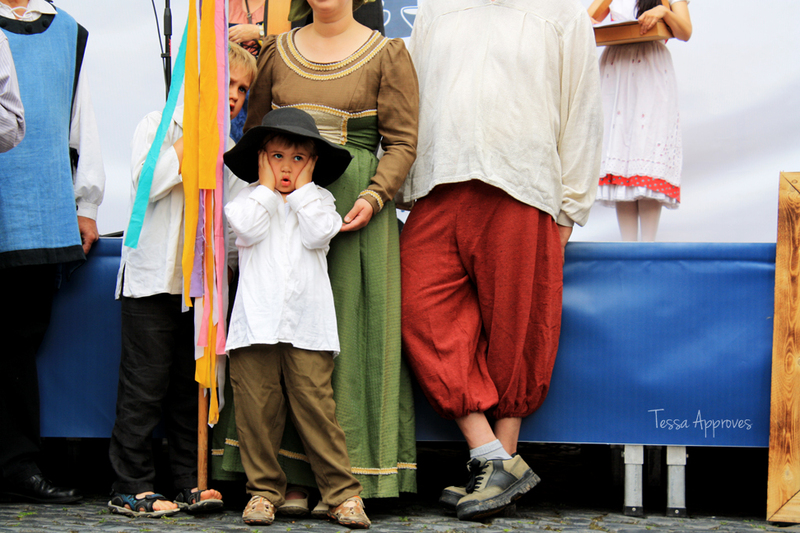 The executioner in Görlitz didn’t only perform executions and torture criminals. It was also his task to remove dead livestock from the city, and using the scavenged parts of the animal to earn money, as well as “taking care” of stray dogs and cleaning filth from the streets. Because of this experience with animals, the executioner typically had a lot of anatomical knowledge and were called upon by the city people when they needed a surgeon for their animals and even for themselves. Still, the executioner remained a dishonorable position and he was required to live at the city gates, to wear a green hat and wasn’t permitted to enter taverns. 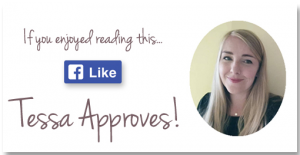 It was also considered inappropriate to marry the children of an executioner. 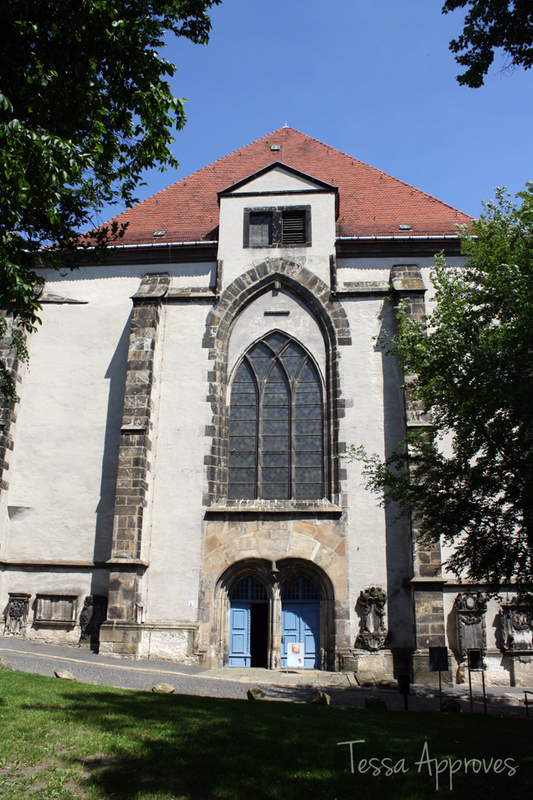 One of the oldest churches in the city, the Nikolaikirche hasn’t been used as a church in many years – instead it’s home to an expressionist style memorial to the city’s fallen soldiers in WWI. 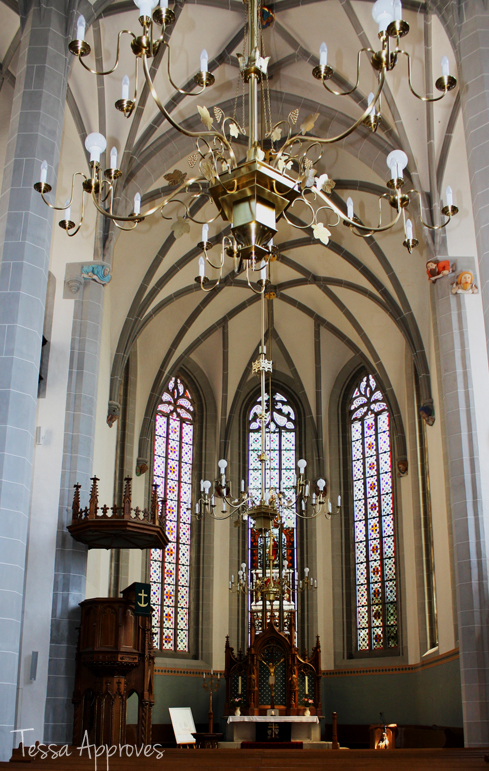 Beside this church is an amazing cemetery with elaborate gravestones & crypts dating back as far as the 1300s. 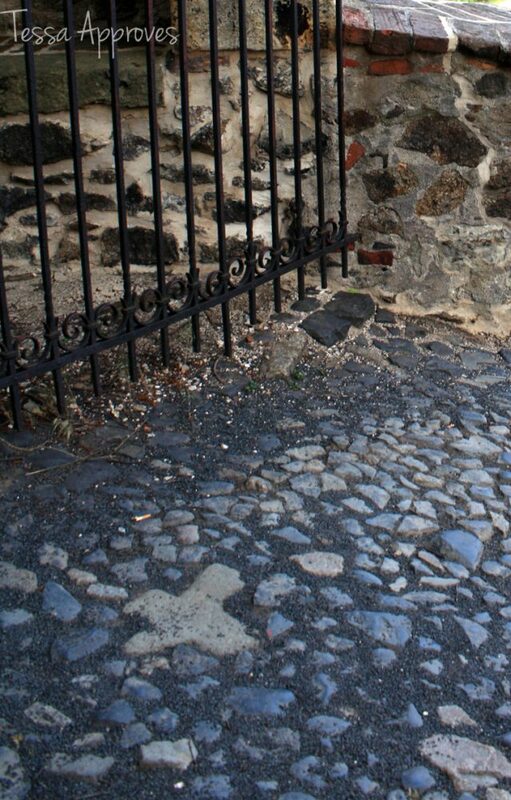 The graveyard is free to enter and visitors can enter the church March through October with a €2 entrance fee. 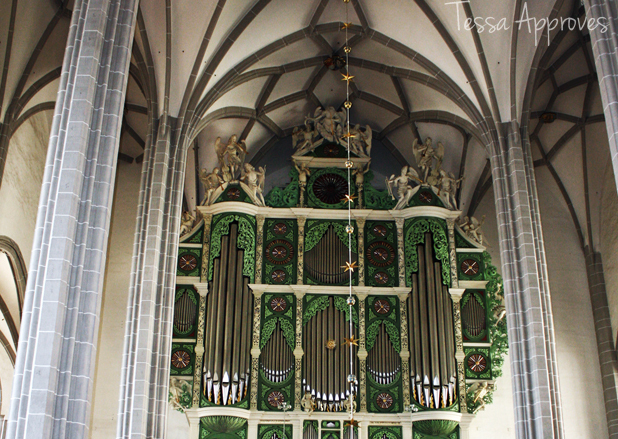 Read more about the Nikolaikirche here. 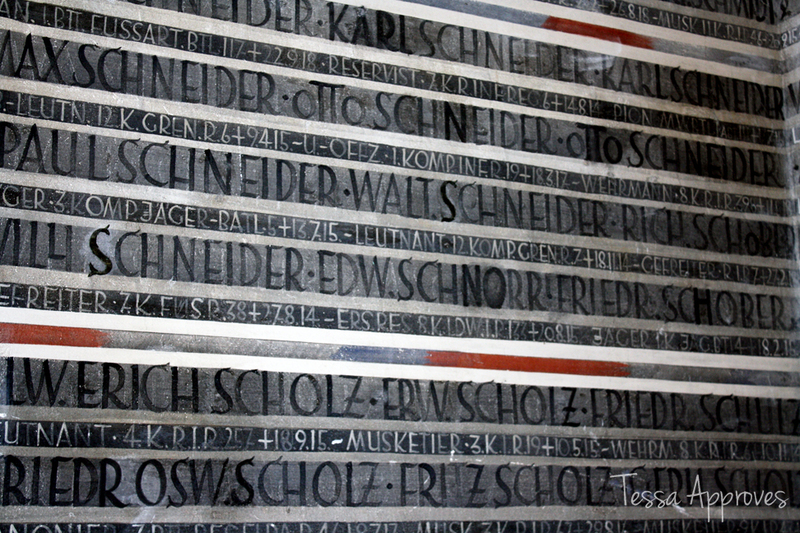 Read more about the Nikolaifriedhof here. The Spielzeugmuseum in Nikolaivorstadt has a collection of antique toys, as well as a permanent exhibit on toys from the GDR. They also have crafting events for children. The toy museum in Görlitz is open Wednesday through Friday 10-4pm and 2-4pm, weekends from 2-5pm. Entry costs €3 for adults and €1.50 for children. 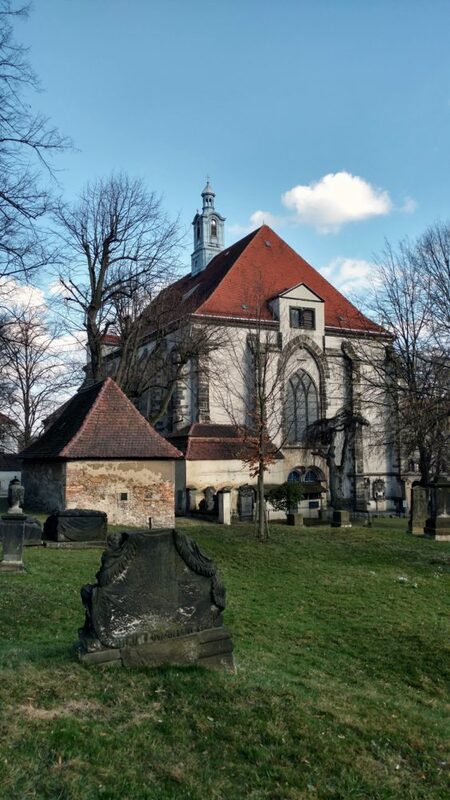 This monument in Görlitz is a replica of the Holy Sepulchre in Jerusalem built by a wealthy merchant in the 1500s after a pilgrimage to Jerusalem. It’s just one stop from the Stations of the Cross. 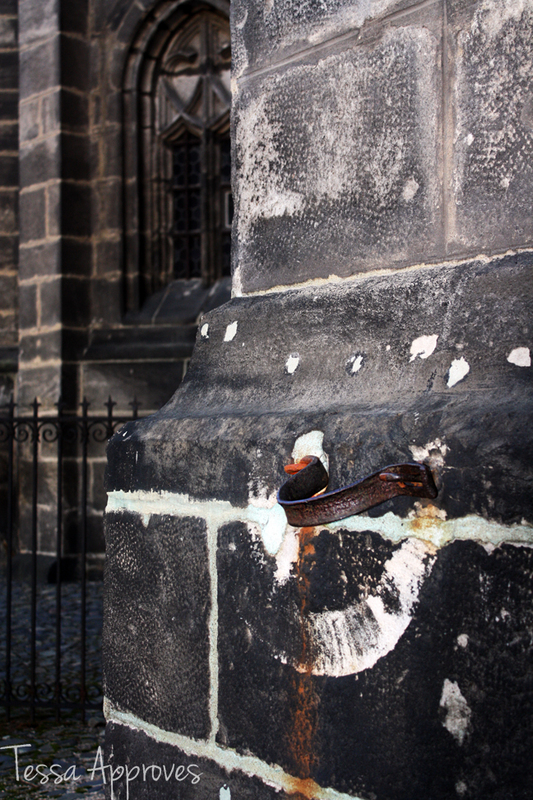 Each year on Easter a procession led by a man carrying a cross walks from the Peterskirche crypt to the Holy Grave. Read more about the Heiliges Grab here. 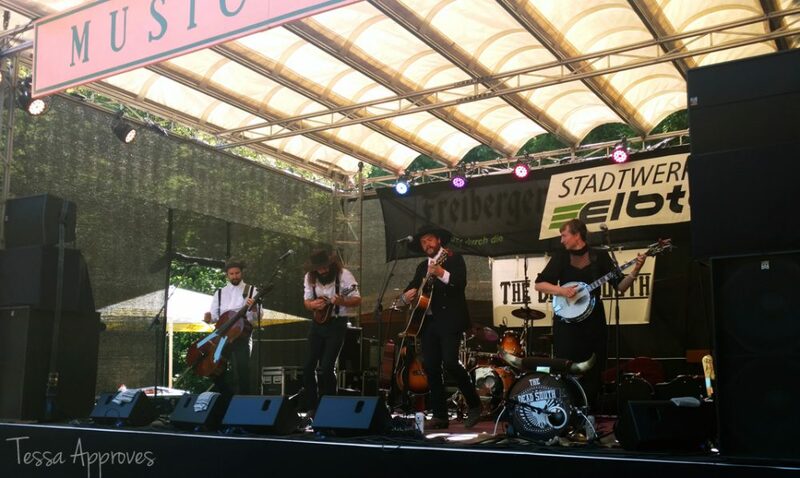 Last week I had a tour of the Brauner Hirsch (brown elk) in Görlitz, a massive former hotel on the Untermarkt that is now a popular filming location. 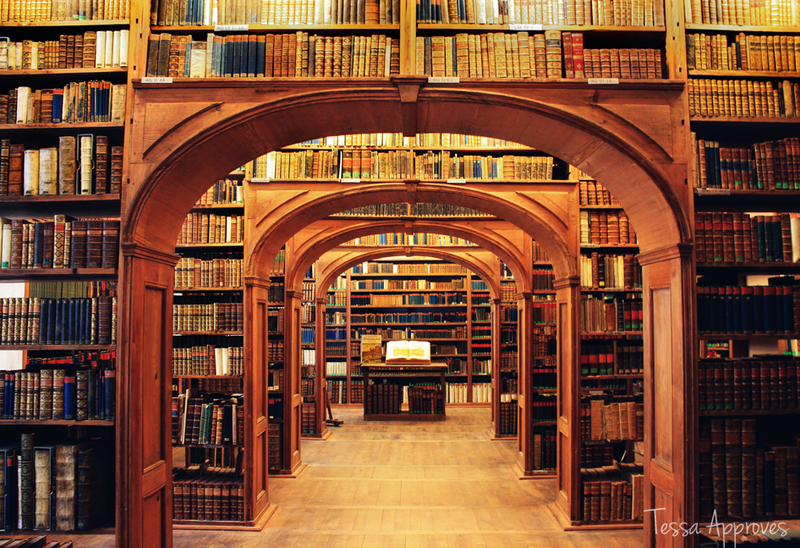 Görlitz has acquired the nickname Görliwood because it’s featured so frequently in films. I always knew that the Kaufhaus in Görlitz was featured in the film The Grand Budapest Hotel directed by Wes Anderson, but I didn’t realize how many other scenes from the film also took place in Görlitz! 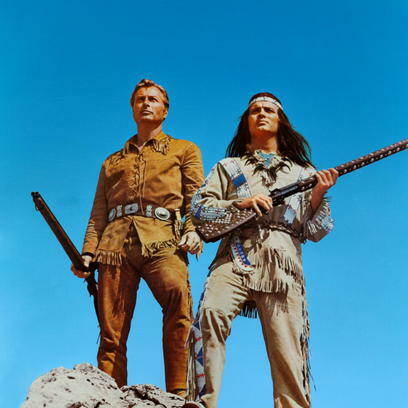 I hurried home from the tour and finally watched the movie – yes, I’m embarrassed to admit that I’d never seen it – and was shocked that almost every scene in the film was a place that I recognized from my new home town! 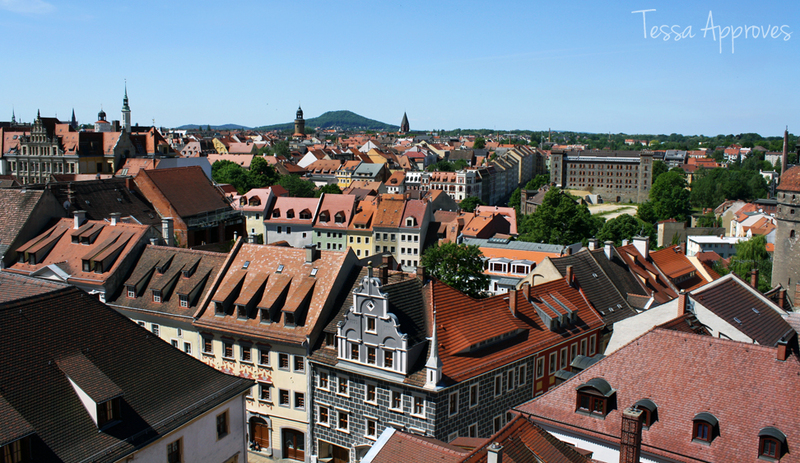 This is a tour of the city of Görlitz, as seen in the film! The most well-known scenes filmed in Görlitz were the interior shots of the Grand Budapest Hotel lobby, which were filmed inside the gorgeous Kaufhaus in Görlitz. There are plans to reopen it as a store in the future. 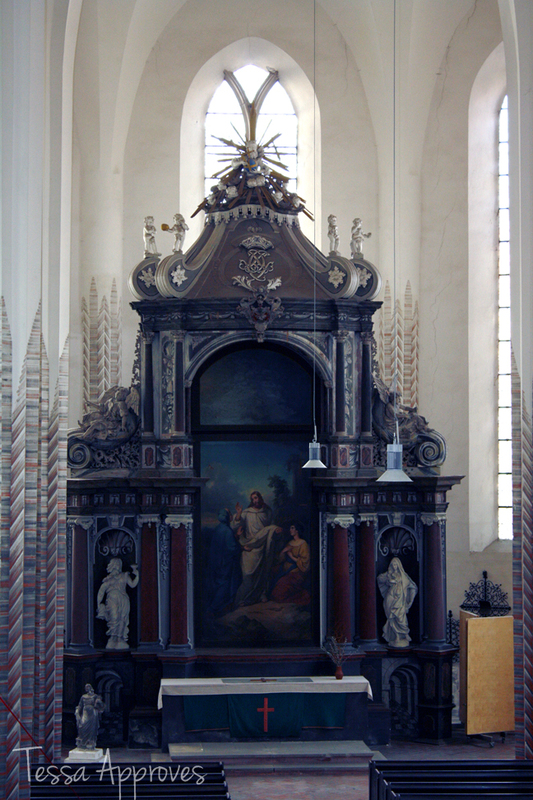 An early scene where the author, played by Tom Wilkinson, is in his study was filmed inside the Brauner Hirsch in Görlitz. You can still see the funky wallpaper left behind by the film crew. 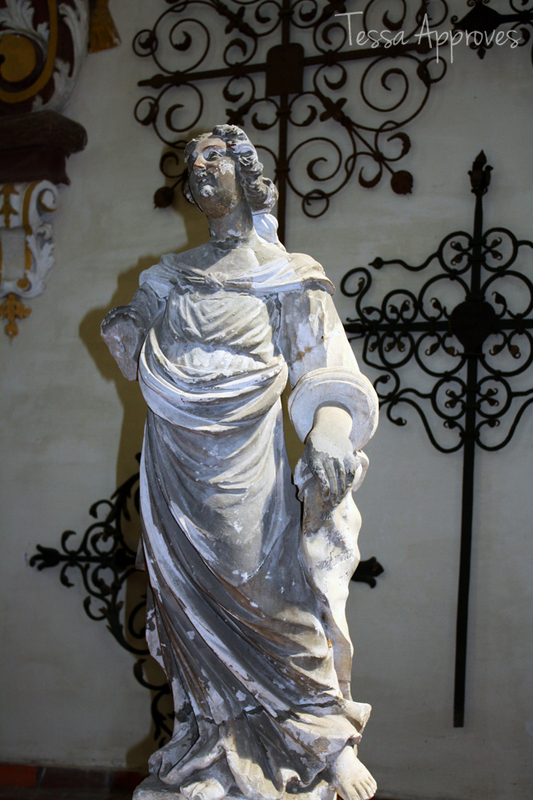 The scene where Jopling, played by Willem Defoe, pays a visit to the sister with the wooden leg was filmed in the courtyard at the Brauner Hirsch in Görlitz. This kitchen scene from inside Madame D’s (Tilda Swinton’s) palace was filmed inside the Brauner Hirsch in Görlitz. 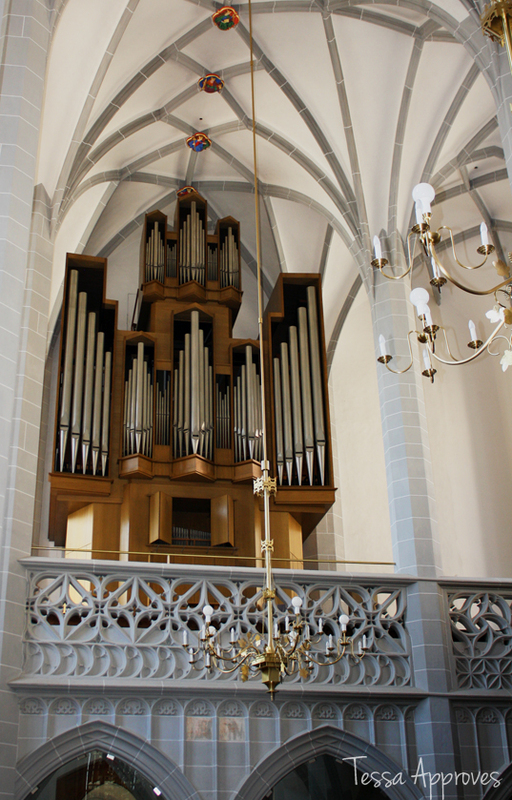 Zero’s tiny room (played by Tony Revolori) at the Grand Budapest Hotel was also filmed inside the Brauner Hirsch in Görlitz. Agatha’s room (played by Saoirse Ronan) in the attic above Mendl’s was filmed in the attic of the Brauner Hirsch in Görlitz. A few bath scenes from The Grand Budapest Hotel were also filmed in the former baths of the Brauner Hirsch in Görlitz. 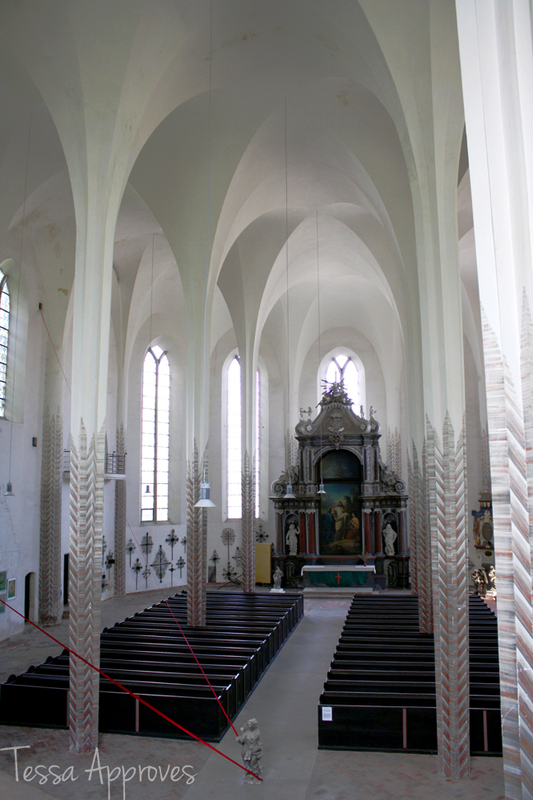 The interior shots of the convent in the film where shot inside the Dreifaltigkeitskirche on the Obermarkt in Görlitz. 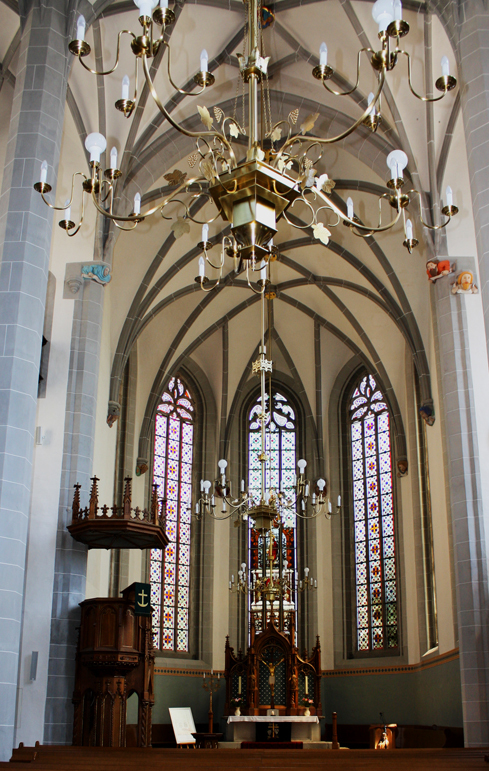 Click to read more about this beautiful church. 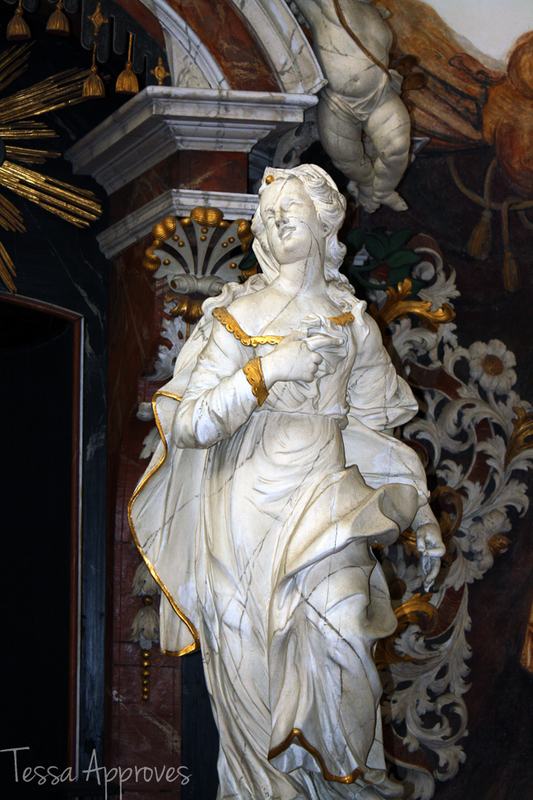 This scene of another hotel concierge was filmed in front of the Schönhof in Görlitz, a beautiful renaissance building that now houses the Silesian Museum. 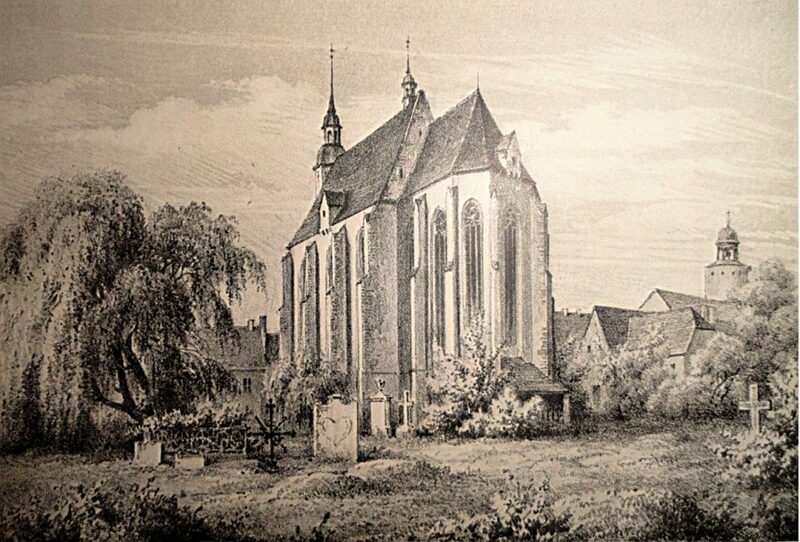 This scene outside the convent was filmed in front of the Brauner Hirsch on the Untermarkt in Görlitz. This enchanting carousel scene featuring the characters Agatha and Zero was filmed on Langenstraße in Görlitz, in front of the former restaurant Zum Flyn’s. In this scene featuring the Lobby Boy, Zero, you can spot the Nikolaiturm in the background – I live just down the street from this tower. This street scene where Agatha is riding her bike was filmed in the Fischmarkt in Görlitz. 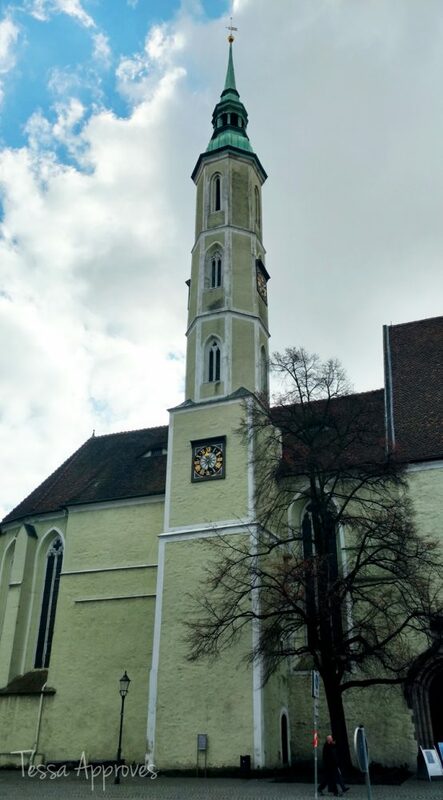 The building on the right is a great restaurant called Gambrinus and the tower is the Dreifaltigkeitskirche. This scene was filmed on Bruderstraße, between the Obermarkt and Untermarkt in Görlitz. 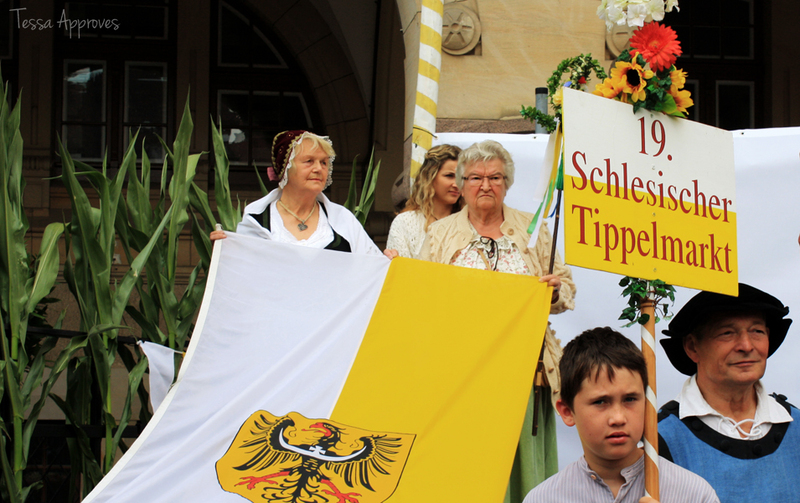 In the background you can see the Reichenbacher Turm. This scene is several different buildings from the Untermarkt stitched together. On the left is the stairs to the town hall, in the center is the portal to the Ratsapotheke and on the right is the Scales building on the Untermarkt. 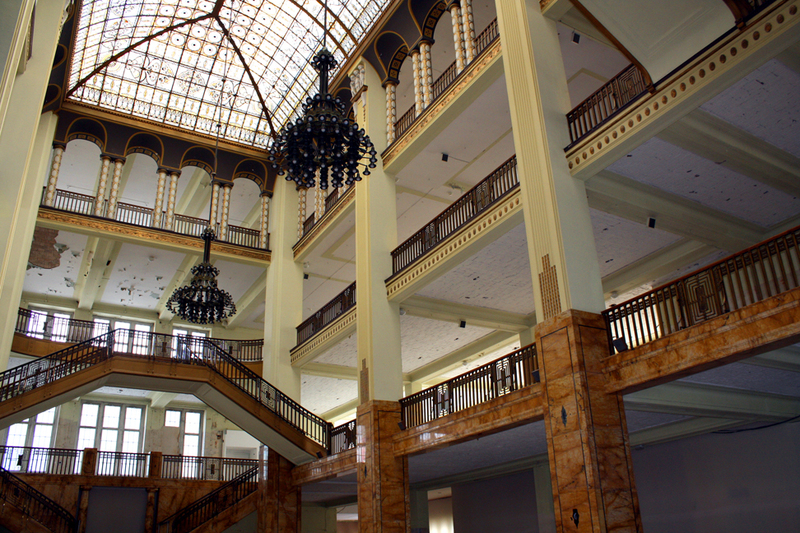 This scene inside the hotel Grand Budapest was filmed inside the Stadthalle in Görlitz. 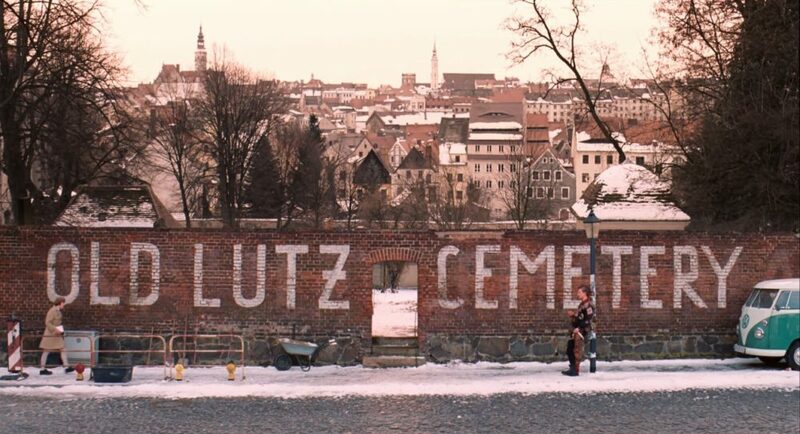 In the beginning of the film when the girl is visiting the grave of the author, they show a wall which can be found on Bergstraße in Görlitz and the background features several of the city’s towers. 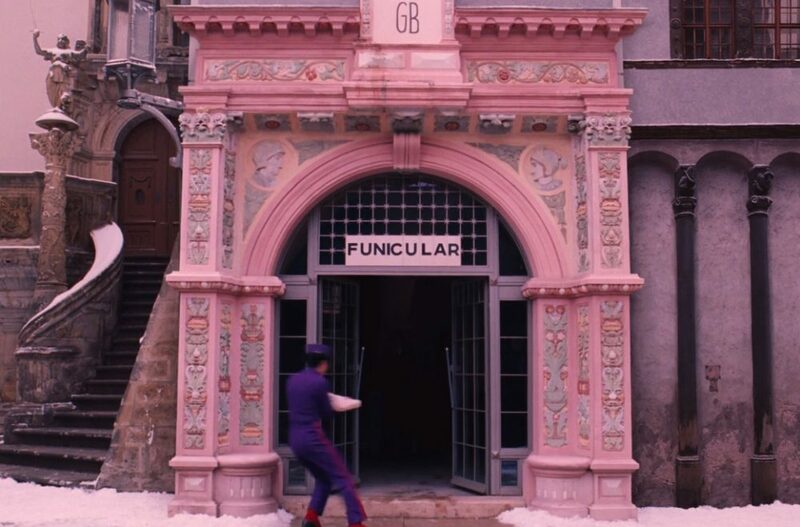 There were also several locations in the film The Grand Budapest Hotel that can be found near Görlitz. The scene when Zero and Agatha marry takes place in Sächsische Schweiz (Saxon Switzerland National Park), which is a popular hiking destination near the border with the Czech Republic. 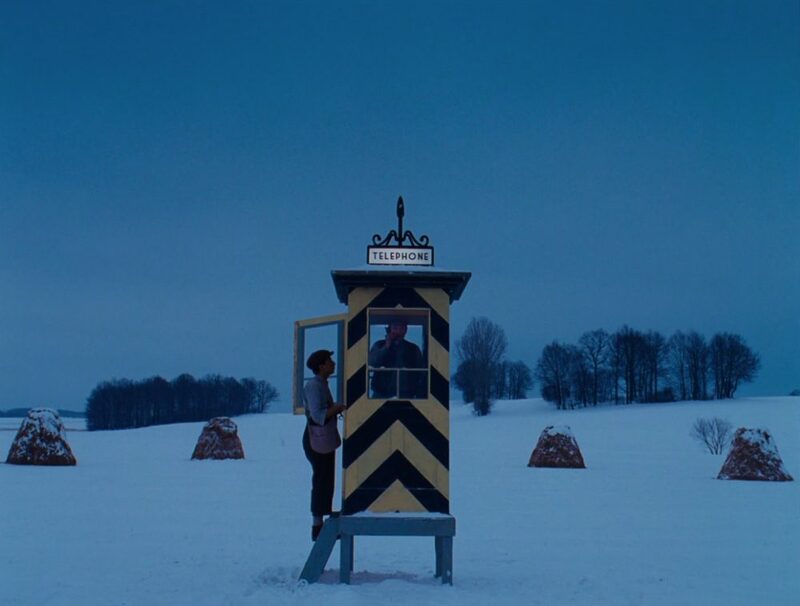 The scene with the lone phone booth in the middle of nowhere was filmed in the nearby Königshainer Berge. 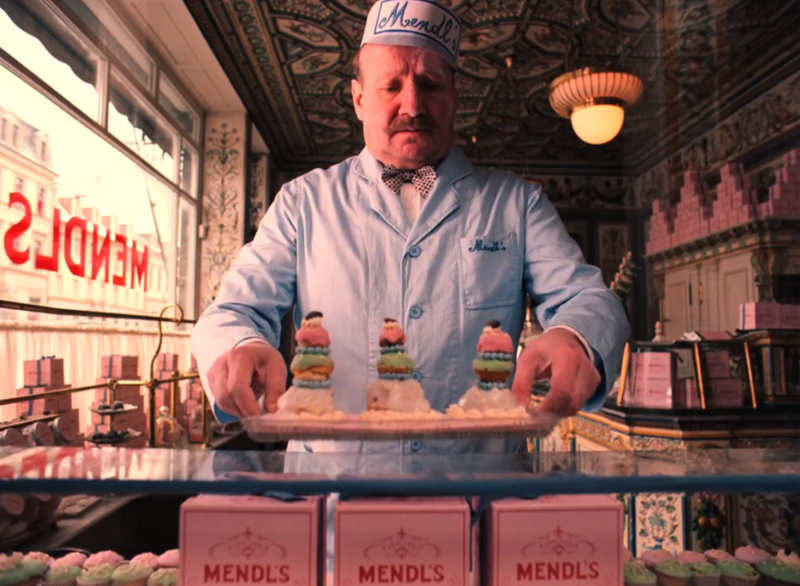 The interior of the sweet shop Mendl’s where Agatha works was filmed inside the Molkerei in Dresden, a beautiful milk shop that is covered with hand-painted tiles. 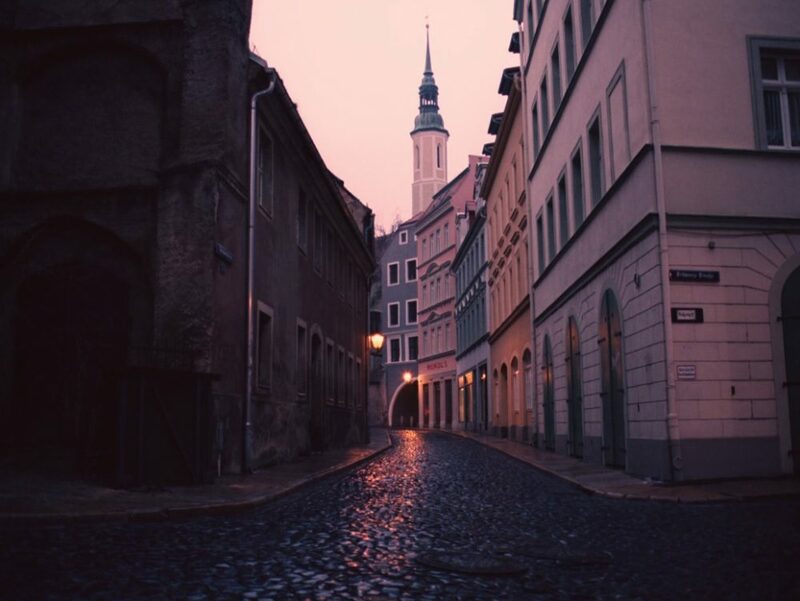 When you visit Görlitz, it’s easy to see why it is such a popular location for films, The Grand Budapest Hotel being just one of many. 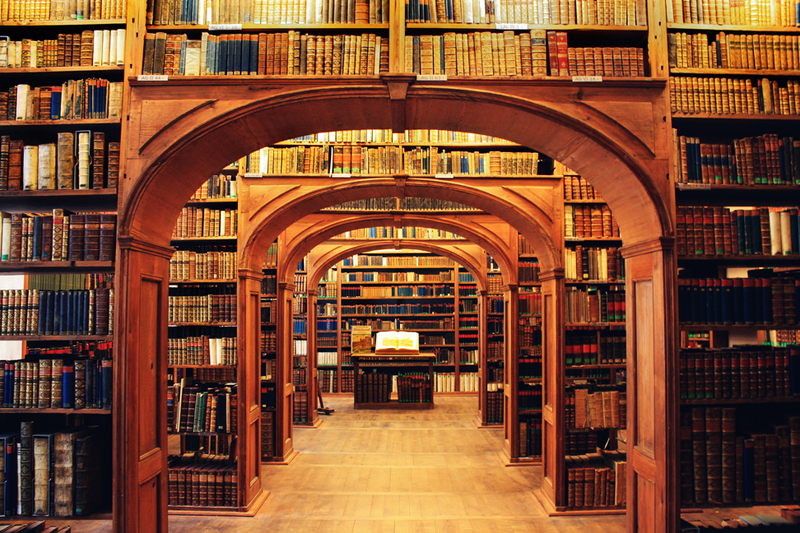 It has a variety of well-preserved, historic buildings from all different time periods as well as some buildings that look “old”, in spite of many of the buildings having been restored. 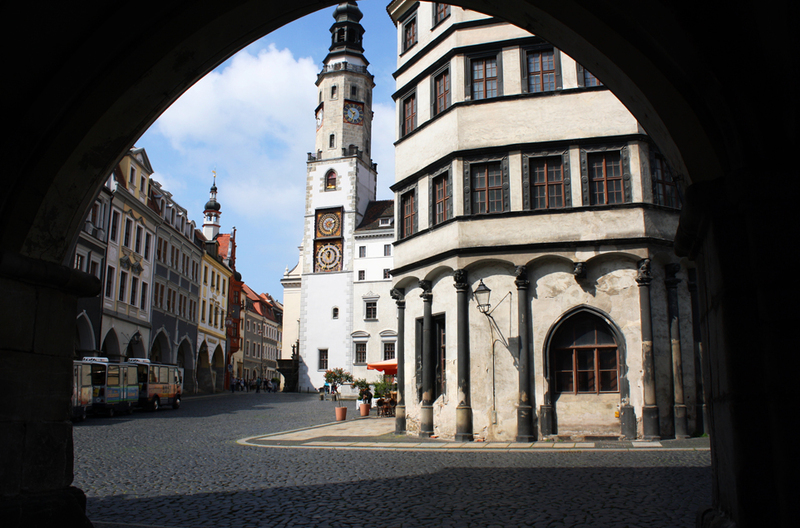 Görlitz is very proud of their nickname Görliwood and they go out of the way to make it easy and attractive for film makers to feature our beautiful city. 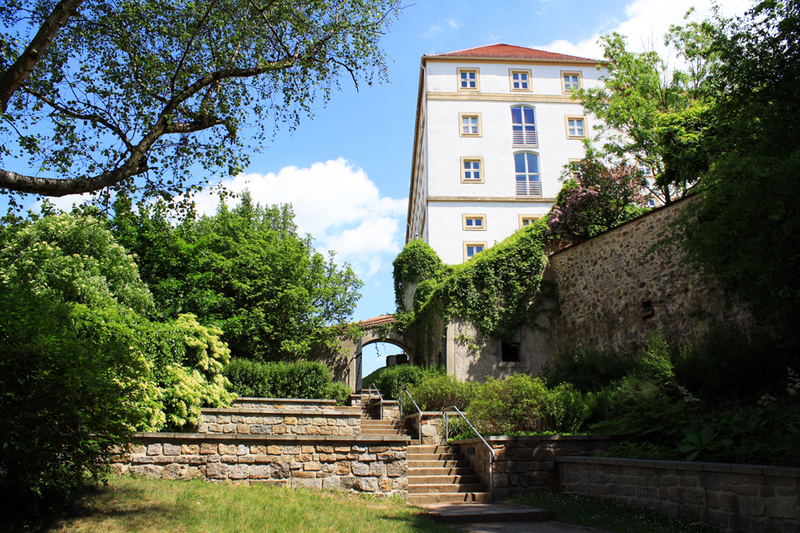 The Kaufhaus is currently open to visitors on Thursday and Friday from 3pm-6pm. 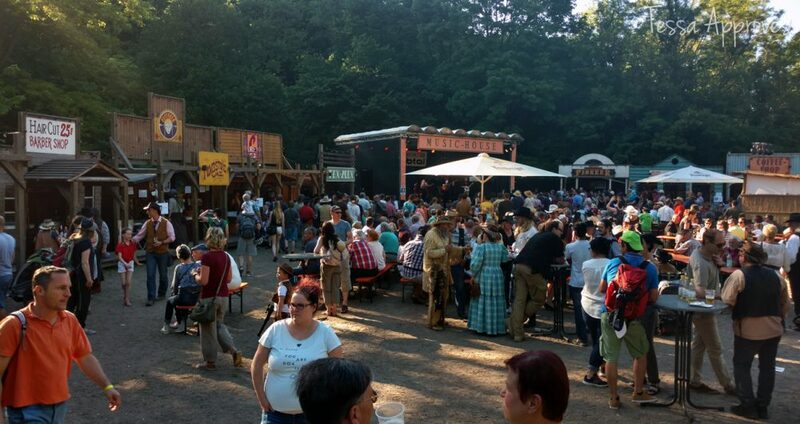 Tours of the Brauner Hirsch in Görlitz during the summer are offered on the 1st and 3rd Saturday of the month at 4pm. The price is €4 and it lasts about one hour. 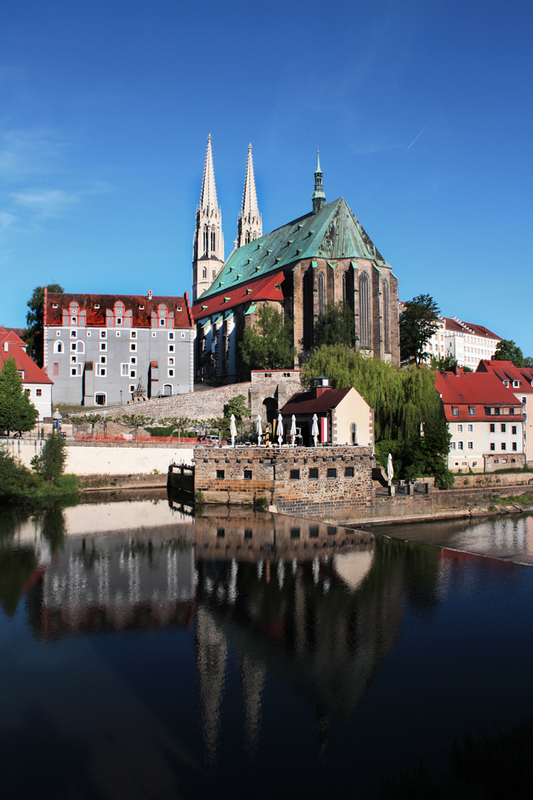 The tourist office i-Vent also offers tours showing locations where movies and television shows were filmed in Görlitz. 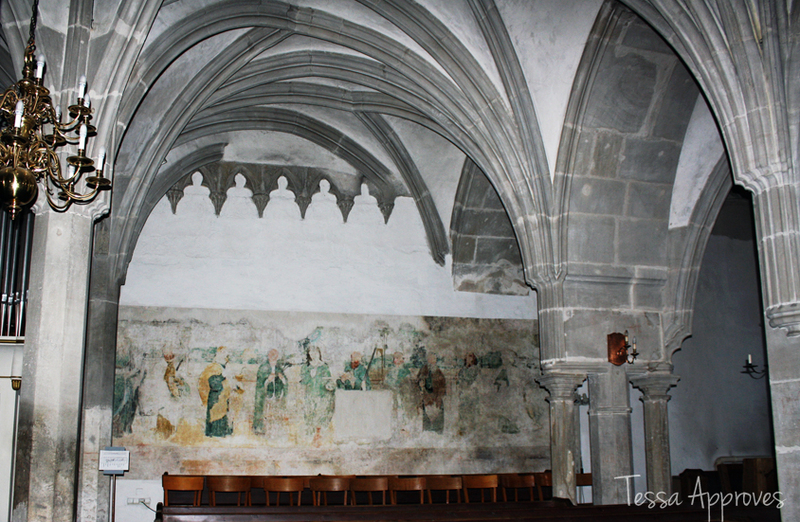 These tours are offered in German, check the website for more information.